I have to admit that the hardest part of the CSA year for me is the fiber prep, before we send the clip off to Lynn at Spinderellas. I want the fiber to be as dirt- and grass-free as possible, so that her work is simpler, and closer to the carding machine. That way we can keep everybody's costs down. This year, we are abundantly blessed with more fiber than ever before - we have nine sheep fleeces, both Gulf Coast Native and Jacob, six alpaca fleeces, and a bunch of sheep and alpaca fleeces from other local breeders. It's a glorious, intoxicating mountain of fiber. 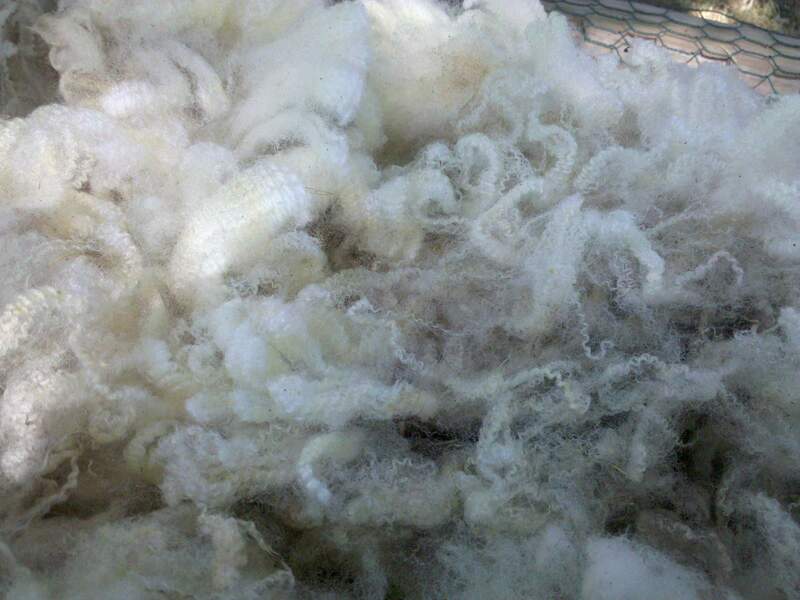 But for the best product, each fleece needs to be spread out on the skirting table and assessed for fineness and cleanliness, before taking a trip through the washer. It's a challenge to old backs, and a challenge for hot-weather-sensitive brains--there are so many decisions to make, and lessons to learn. I can see in the fleece the results of both sheep heritage and of my husbandry: "Why are these tips brittle? Where did this yellow yolk layer come from? Could these muddy tips have been avoided? It's too hot in Texas to coat the sheep, so how can I keep out more hay? Holy cow, this is soft and crimpy!" For instance, today I took a crack at the fleece of our sweet bottle-baby GCN sheep, Itzhak. Itzhak is Mary Elizabeth's twin brother, the friendly guy with the crumpled horns. (They're actually called "scurs," but that sounds so disparaging...) Itzhak's fleece shares the same abundant micro crimp as his sister's, if not her uniform, intense fineness. He's pretty soft, but there are parts that are just a little "britchy." (Rhymes with "scritchy" for a reason.) We also find in his fleece the frustrating combinations of soft-but-grassy, crimpy-but-coarse, and luscious-fineness-but-muddy-weak-tips. You can divide this fleece up into a dozen different little piles. Yet I've decided to fall back to just two piles: 1) too muddy/grassy/tippy to mess with--I don't care how soft it is, (this pile goes in the "stuffing" bag) and 2) soft enough and I hope this crap will come out in washing and carding. Pile #2 is now enjoying an extended hot, soapy soak in Wanda the Washerwoman. And that's the process I use for the wool. The alpaca fiber gets a little different vetting, because it's sometimes dirtier, but without the lanolin. Every alpaca is different - some have fine fiber that hangs on to the little bits of grass and sticks, and others have a density that excludes the grass from working into the fiber in the first place. This is a very hands-on process, with lots of room for creative expression and laborious toil. When we all sit down with our gorgeous roving, we'll remember the sweaty days bending over the skirting table and let out a large, appreciative sigh. So, there's my fiber science in a nutshell. (I'm here to take the mumbo-jumbo out of the magic.) The proof of the pudding is in the finished product, and you'll be the ultimate judge of our success. There is light at the end of the fleece tunnel! I'm so glad you post this stuff. I had no idea what all went into the process from the animal to the needles. I hope to come out sometime this summer (since school is out) to see first hand what goes on. Looks really cool! I am looking to buy a local fabric. Do you also sell fabric? Or have recommendations of locals who spin your wool?